The Kool-Aid Mullet – It’s Big & It’s Red… Oh Yeah! | JIFFY FEET – Southern Fried Awesome! The Kool-Aid Mullet – It’s Big & It’s Red… Oh Yeah! The Kool-Aid Mullet – It’s Big & It’s Red… Oh Yeah!, originally uploaded by jiffyfeet. And he’s probably full of sugar too! Man this thing is BEAUTIFUL… so pretty. 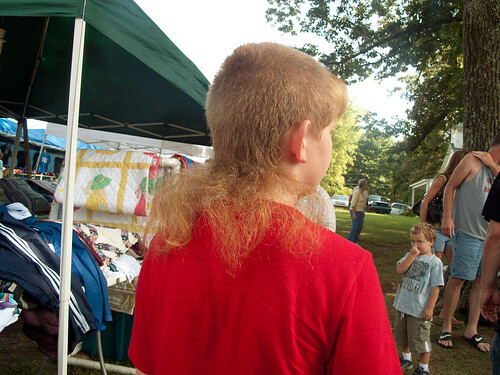 This might be the best kid mullet ever!!! And as a bonus, check out the little kid in the background picking his nose, haha. Thats some serous diggin for gold going on! Major props to The Draplin Design Co. for snagging this pic, you are a record holder in my book sir! The Draplin Design Co. wants to thank the good people of Highway 127 for one hell of a time on the World’s Longest Yard Sale. 3 Comments on "The Kool-Aid Mullet – It’s Big & It’s Red… Oh Yeah!" it’s like fine strands of pure copper growing out of his head! he and the gold diggin’ kid should start a business. Best mullet yet, fur sure.